Try our specialty of 1-3/4″ thick cuts of “Peter’s Prime Beef” dry aged for exceptional tenderness and flavor. Complete your meal with a choice from outstanding accompaniments and our extensive wine list for a night of casual fine dining. 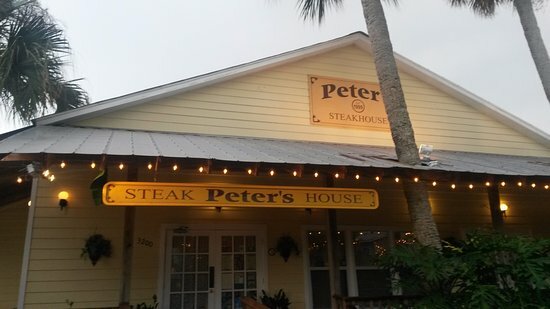 Peter Buchner, proprietor, opened Peter’s Steakhouse in 1999 and has established a loyal group of true beef lovers. The restaurant is situated in historic downtown Jensen Beach, Florida. The menu features the specialty of 1 3/4″ thick cuts of “Peter’s Prime Beef” dry aged for exceptional tenderness and flavor. Choose from New York Strip, Porterhouse and T-bone’s all prepared to your special order. Once you have made the main course selection, choose from the outstanding supporting accompaniments; Peter’s Hash Browns, Creamed Spinach and Fried Shoe String Onions are house favorites. Finally, enjoy a fine glass of wine with your menu selection from the select wine list. Peter has selected some of the finest choices of wines to compliment your meal. The evening’s final performance will surely be one not to forget…dessert. Peter’s homemade Apple Strudel is made from Mom’s own Austrian homeland recipe served with a big bowl of Schlag (whipped cream). Stop by our restaurant to get a gift certificate. They are perfect for every ocassion. Birthdays, anniversaries, Christmas or just to say thank you!